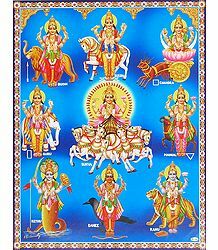 Hindus worship multiple gods and goddesses and each of them is believed to have unique powers. As such, Ganesha and Lakshmi are known to grant success and prosperity while Saraswati is believed to bless one with wisdom and intelligence. 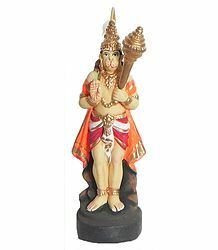 The Hindu God, Shani, is a powerful god believed to ward off the evil eye and remove obstacles. Shani is the lord of the planet Saturn (one of the nine planets as per Hindu astrology), and is worshipped on Saturday, which literally means Saturn Day. 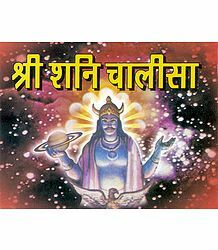 The word Shani, also known as Shanaishchar, literally means the one who moves slowly and considering that Saturn takes about thirty years to orbit around the Sun, the name is an apt one for the lord of the planet. 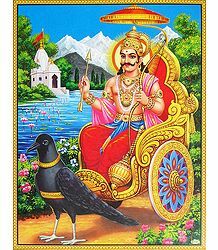 Shani is also known by many other names like Sauraa (the son of Sun God), Mandaa (slow, dull), Kroor Drishti/Lochan (cruel-eyed), Pangu (disabled), Saptaarchi (seven-eyed), Asit (dark complexioned), etc. These names are associated either with his personality or legends associated with him. The story behind his appearance is that while God Shani was in the womb of his mother Chhaya, she was engrossed in penance and prayers to Lord Shiva so much that she stood in the hot Sun without food, water or shade. Thus, Shani is dark complexioned and is depicted with dark clothes (mostly blue), wearing a blue sapphire and holding a sword, a trident and a bow and arrow. His countenance is polite, yet gleaming and the eyes are half-opened. He has multiple rides and astrologers believe it depends on the task at hand. These rides include horse, dog, crow, buffalo, vulture, elephant, deer, donkey, and jackal. Shani is the son of Surya, the Sun God, and Chhaya. He is also the brother of Hindu God of Death and Justice, Yama. The legend goes that Sun's wife Sandna was unable to take his brightness, and she decided to move to the forest to do penance. However, to ensure no one comes to know of her disappearance, she created a mirror image, a shadow, of herself named Chhaya and asked her to never let the secret be known to her husband and perform all marital duties just as if she were Sandna. Chhaya then took the place of Sun's wife and bore him children, including Shani. Surya, the Sun God, himself bright and shiny, was unable to believe that his son could be so dark complexioned and he doubted Chhaya's faithfulness to him. Shani, born with great powers, was upset at the insult of his mother and cast a cruel glance at his father, the Sun, which charred his body and stopped his chariots from moving. A worried Sun God called out to Lord Shiva for help who came and explained to him the reason for Shani's wrath. At this, the father apologized to his son and finally, regained his previous appearance and powers. But this was only the beginning of a difficult father-son relationship which was not helped by Shani's rigid and angry nature. It is also said that when Shani was born, Sun went into an eclipse, a further sign of the enmity between the two since Shani's birth. Yama is a sibling of Shani and older to him. Both these sons of Surya are said to be the judges of a person's deeds, as per Vedic mythology. While Shani stands for truth and righteousness and punishes the wrong doers during their life time, Yama is said to mete out the punishment for one's misdeeds after one's death. Lord Shani is a devotee of Lord Krishna and known to be immersed in the thoughts of his deity at all times. 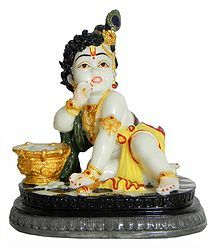 When Lord Krishna was born, all gods visited Nandgaon, his birthplace. However, Yashoda, Krishna's mother, did not allow Shani to enter the house as she believed Shani's gaze would cause some harm to her child. This saddened Shani and he went to the woods nearby to meditate and do penance. Lord Krishna appeared in front Shani Deva and asked him the reason behind his penance. Shani Deva expressed his frustration at people perceiving him to be cruel when he was just doing his duty of meting out justice. He also told him about his disappointment at not being able to see Lord Krishna. At this, Lord Krishna gave Shani the boon that people worshiping him will be freed of their troubles and then asked him to stay on in Nandanvan. Later, when Krishna played his divine flute, its sweet sound attracted Gopis (womenfolk of Nandgaon) but Lord Krishna turned himself into a Kokila (Cuckoo bird). Since then, the place is known as Kokilavan Shanidham. Shani and Lord Hanuman share a special relationship as the latter once freed Shani Deva from the imprisonment of Ravana, the mighty king of Lanka. In gratitude, Shani promised Hanuman that he would lessen his negative influence on anyone who prayed to Lord Hanuman. As such, people who have Shani Dosha (the negative influence of Shani) in their horoscope pray either to the Lord himself or Lord Hanuman to soften its impact. Even the Pandava brothers are said to have found a solution to their troubles only after they received help and blessings from Lord Hanuman. There are many legends associated with Shani Deva. One of them gives the story behind the disability of Shani. One day Shani was extremely hungry and went to his mother to ask for food. His mother Chhaya asked him to wait as she wanted to make an offering to the Gods first. Shani insisted on being served even before the Gods and when his mother did not heed, he kicked her in anger. This upset Chhaya so that she cursed him that his leg would break. A worried Shani went and recounted the event to his father, Surya, the Sun God. Suya was surprised that a mother could curse her son so and confronted Chhaya who admitted that she was only the shadow of Sandna, who was away doing penance in Himalayas. 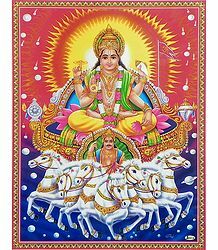 Now, that Surya knew that Chhaya was indeed his mother, he told Shani that the curse would come to be true, but he blessed his son so that he had a prominent position among all other planets. Shani was married to Sangya, daughter of Chitrrarth. Sangya, though a talented and religious lady herself, was sad at her husband always being absorbed in the thoughts of Lord Krishna. One day, she returned after taking a bath post her menstruation period, and was hoping to attract the attention of her husband, but Shani, as usual, was in meditation. This enraged Sangya, and she cursed Shani that since you enjoy thinking about Krishna so much that you can't spare even a glance at me, you will now always have to look downwards. If you look directly at someone or something, it will be destroyed. When Shani finally was able to calm her down and please her, she repented her curse but she was a pious women and the curse could not be undone. Ganesha, the new born son of Lord Shiva and Parvati, was an adorable child and Parvati was extremely proud of her son. She invited all the gods in heaven to come and bless him. 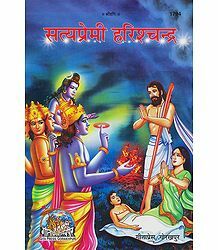 When Shani went, to Mount Kailash, the abode of Shiva and Parvati, he kept his gaze lowered and would not look at him.When Parvati insisted that Shani look at her son to bless him, he explained that he has been cursed by his wife that everything he looks at will be destroyed but Parvati was adamant. Finally, Shani looked at Ganesha from the corner of his half opened eyes, and lo and behold, Ganesha's head was chopped off from his body and disappeared. Seeing this, Parvati fainted and a worried Shiva went in search of a head. He found an elephant under a tree and chopped his head to be used as a replacement head for his son. The righteous king Harishchandra was undergoing a seven and a half years of Shani affliction (Sadhe satti) on his horoscope and as a result, he lost his kingdom, was separated from his wife and his son passed away. But all of these were not enough for him to leave the path of honesty and integrity. When his wife came to cremate his son, the king asked her to pay cremation taxes with the only thing she possessed, the saree worn by her. This is when Shani and other Gods appeared and pleased by his honesty, reinstated the king and brought his son back to life. Once the Nava Grahas or the nine planets of Hindu mythology had an argument amongst themselves as to who is the most important planet. They went to Lord Indra for the decision but a clever Indra did not want to incur the wrath of any of them and so, suggested that they go to King Vikramaditya of Ujjain, who was known the world over for his justice and wisdom. The king also had a difficult task at hand so he got nine thrones made of different metals and assigned a rank to each metal throne, the gold one being the first and iron one being the ninth in rank. Now, he asked each of the planet lords to choose a throne. They did so as per their natural affinity and Shani chose the iron throne which was of the lowest rank. This displeased him so much that he warned the King that he would take revenge of this humiliation. From there, began the King's bad days that lasted for seven and a half years in which he was away from his kingdom, living like a commoner, then he lost his limbs and had to do hard labor. Finally, Lord Shani took mercy on him and returned everything to him. The king returned to his kingdom and asked his subjects to keep fast and pray to Shani on Saturdays. The gravitational pull of the planet Saturn, which represents Shani, is 95 times that of Earth's gravitational pull. Astrologers believe that this is the reason why our thoughts, both good and bad, and our plans reach the lord of the planet and he influences them. Saturn, a malefic planet, presides over the two sidereal signs Capricorn and Aquarius. It is exalted in the house of Libra and fallen in the opposite House of Aries. Shani takes around two and half years to pass through each zodiac sign. This period is known as Dhaiya. 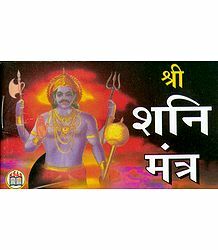 Sade Satti is the period that begins when Shani enters the zodiac sign immediately before the zodiac sign of Moon at the time of an individual's birth. It continues while Shani transits through the next two signs which makes the total duration as seven and a half years. 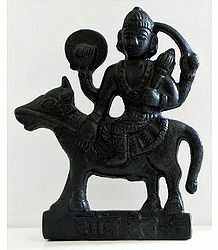 A horoscope afflicted by Shani or under Dhaiya or Sade Satti of Shani suggests disputes, delays, diseases, struggles, disharmony, wisdom borne out of experiences and death in the life of that person during the affliction period. It also brings an interest in spirituality, denouncing of materialistic pleasures, and enlightenment pertaining to the mysterious ways in which one's karma's are punished and rewarded. Shani also rules over bones and legs and brings chronic diseases. It also rules the entire nervous system and thus, a person under the malefic effect of Shani may have headaches, neuralgia, and other disorders related to nervous system. It also makes a person work hard to earn his livelihood. Generally, a person goes through three Sade Satti's in his life: once in childhood, then in youth and finally, in old age. It is said that no human being, however powerful or pious can escape this period and its effects. In fact, according to Hindu mythology, even Gods fear this period and must undergo it as Shani metes out justice to one and all. On the other hand, when placed favorably in a person's birth chart, Shani brings longevity, land, wealth, and fame. It also makes people charitable, lavish, proficient, and generous. 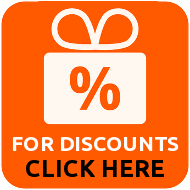 Such people can benefit by choosing professions related to oil, mining, etc. as Shani also rules the netherworld. Other profitable occupations may be those related to transportation, mustard, salt, property dealing and construction, tools and machinery, etc. 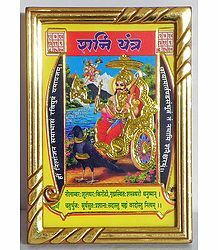 Praying to Lord hanuman, reading Hanuman Chalisa (Verses praising and describing the achievements of Lord Hanuman), and offering a certain quantity of Til Oil (Gingeley Oil) for a specific number of Saturdays in a Hanuman Temple is said to remove problems arising out of a weak Shani or Shani Dosh. Praying to Lord Shiva, chanting Mritunjaya Mantra, and wearing a 14 faced Rudraksha are said to remove the ill effects of Shani Sade Satti. Praying to Lord Shani himself, visiting Shani temple on Saturdays and chanting Shani Mahatmyham, lighting a lamp in front of his image or idol, donating black cloth, sesame seeds, iron vessels, etc are some of the ways to appease Shani Deva. Some astrologers advise wearing or donating blue sapphire by analyzing the horoscope of person troubled by Shani Deva. There are many well-known temples of Shani in India and some of them have interesting anecdotes and history associated with them. One of the most prominent ones is situated in Shingnapur in Maharashtra, India. Over a hundred and fifty years ago, a shepherd once saw a tall black rock and touched it with a pointed rod. The rock started bleeding and everyone in the village was amazed at this happening. The same night, Shani appeared in the dream of the most pious among the shepherds and asked him to enshrine the rock and worship it on Saturdays. The shrine of Shani in the village has no roof and the village houses too are without locks as the locals believe that their village is protected from theft by the Shani Deva himself. Is Shani a Dreaded Foe? Shani has been given the task of judging and giving commensurate rewards or punishments to all depending on their karma or deeds. Shani is also a good teacher. Discipline and responsibility are key qualities in the eyes of Shani and like a good teacher; it teaches people the importance of these aspects of life by forcing them to go through certain learning experiences. While many people believe Shani to be a cause of troubles in their life and fear it, what they overlook is the fact that as per Hinduism, one gets what one deserves as per one's karma or deeds. Good deeds never go waste, while one cannot run away from the consequences of one's misdeeds. Shani's influence on a person's life is really brought upon by the person himself. A person who is prepared to undergo the trying times with perseverance and righteousness is sure to be rewarded by him. Thus, Shani is neither a friend, nor a foe. He is neutral and just.